Rachel, Gretchen and Kyle take a deeper look at the role women have played in the kaiju genre. For this episode we are diving into the history of the kaiju genre and its relationship with women – from characters to actors, we tackle a few topics that some people might consider to be a sensitive subject but that we feel should be a point of discussion amongst lovers of these films. 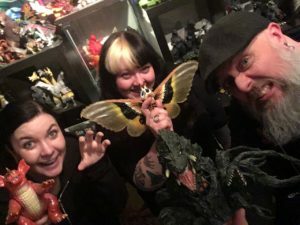 I was lucky enough to have two kaiju fans of the female persuasion, Rachel Cook & Gretchen Brooks, hang out with me to talk with me about that relationship. We discuss what it’s like being a female fan in this genre, representation on the big screen and much more! Legendary Pictures’ newest monster epic, Kong Skull Island (2017) has just opened nationwide. This new film is the focus for this month’s Daikaiju Discussion. If you want to submit your thoughts, questions and reviews for this new Kong entry, make sure to submit your homework before Thursday, March 23rd to be incorporated into the episode.